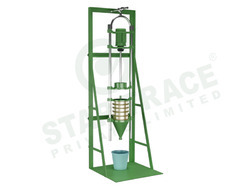 The Laboratory Wet Sieve Analysis Unit provides efficient Screening to dislodge the clayed adhered coatings of ore grains. The unit can accommodate 8 nos of standard test sieves of 2" height and 8" diameter and with a spray nozzle (Eye type) for uniform spray of water for efficient screening. Bestowed by a team of highly experienced & qualified professionals, we are offering Testing Sieves. A complete set of seven sieves, with slot sizes4.9x30mm, 7.2x40mm, 10.2 x50mm, 14.4x60mm, 19.7x80mm, 26.3x90mm, 33.9x100mm, with dimensions; 300x220x80mm, 320x240x80mm, 300x220x80mm, 360x260x80mm, 390x280x80mm, 420x300x80mm, 470x320x80mm respectively made mild steel. Sieves 20 cm dia are fabricated out of spun brass, without joint frame, double folded bottom, having beading at top, tightly fitting with each other (Endcott pattern), with brass wire mesh, our own brand. Three series are normally available : BSS / ASTM / ISS. 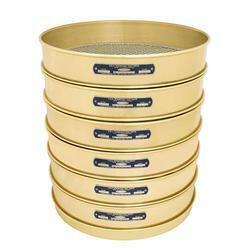 Test Sieves is a common Laboratory requirement. Sieves are used for sieving of chemical powders, medical powders, aggregate, sand soil and cement etc.